"SDHC" redirects here. For the gene, see SDHC (gene). The standard was introduced in August 1999 by joint efforts between SanDisk, Panasonic (Matsushita Electric) and Toshiba as an improvement over MultiMediaCards (MMC), and has become the industry standard. The three companies formed SD-3C, LLC, a company that licenses and enforces intellectual property rights associated with SD memory cards and SD host and ancillary products. The companies also formed the SD Association (SDA), a non-profit organization, in January 2000 to promote and create SD Card standards. SDA today has about 1,000 member companies. The SDA uses several trademarked logos owned and licensed by SD-3C to enforce compliance with its specifications and assure users of compatibility. This microSDHC card holds 8 billion bytes. Beneath it is a section of a magnetic-core memory (used until the 1970s) that holds eight bytes using 64 cores. The card covers approximately 20 bits (2 1/2 bytes) This SD card's storage is approximately 3.5 billion times greater areal density. In 1999, SanDisk, Matsushita, and Toshiba agreed to develop and market the Secure Digital (SD) Memory Card. The card was derived from the MultiMediaCard (MMC) and provided digital rights management based on the Secure Digital Music Initiative (SDMI) standard and for the time, a high memory density. It was designed to compete with the Memory Stick, a DRM product that Sony had released the year before. Developers predicted that DRM would induce wide use by music suppliers concerned about piracy. The trademarked SD logo was originally developed for the Super Density Disc, which was the unsuccessful Toshiba entry in the DVD format war. For this reason the D within the logo resembles an optical disc. At the 2000 Consumer Electronics Show (CES) trade show, the three companies announced the creation of the SD Association (SDA) to promote SD cards. The SD Association, headquartered in San Ramon, California, United States, started with about 30 companies and today consists of about 1,000 product manufacturers that make interoperable memory cards and devices. Early samples of the SD Card became available in the first quarter of 2000, with production quantities of 32 and 64 MB cards available three months later. The miniSD form was introduced at March 2003 CeBIT by SanDisk Corporation which announced and demonstrated it. The SDA adopted the miniSD card in 2003 as a small form factor extension to the SD card standard. While the new cards were designed especially for mobile phones, they are usually packaged with a miniSD adapter that provides compatibility with a standard SD memory card slot. 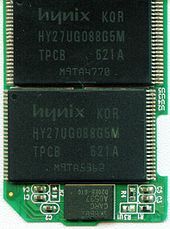 In September 2006, SanDisk announced the 4 GB miniSDHC. Like the SD and SDHC, the miniSDHC card has the same form factor as the older miniSD card but the HC card requires HC support built into the host device. Devices that support miniSDHC work with miniSD and miniSDHC, but devices without specific support for miniSDHC work only with the older miniSD card. Since 2008, miniSD cards were no longer produced. The microSD removable miniaturized Secure Digital flash memory cards were originally named T-Flash or TF, abbreviations of TransFlash. TransFlash and microSD cards are functionally identical allowing either to operate in devices made for the other. SanDisk had conceived microSD when its chief technology officer and the chief technology officer of Motorola concluded that current memory cards were too large for mobile phones. The card was originally called T-Flash, but just before product launch, T-Mobile sent a cease-and-desist letter to SanDisk claiming that T-Mobile owned the trademark on T-(anything), and the name was changed to TransFlash. At CTIA Wireless 2005, the SDA announced the small microSD form factor along with SDHC secure digital high capacity formatting in excess of 2 GB with a minimum sustained read and write speed of 17.6 Mbit/s. SanDisk induced the SDA to administer the microSD standard. 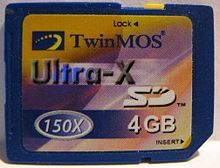 The SDA approved the final microSD specification on July 13, 2005. 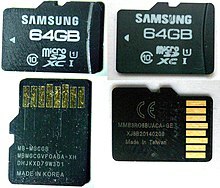 Initially, microSD cards were available in capacities of 32, 64, and 128 MB. The Motorola E398 was the first mobile phone to contain a TransFlash (later microSD) card. A few years later, their competitors began using microSD cards. The SDHC format, announced in January 2006, brought improvements such as 32 GB storage capacity and mandatory support for FAT32 filesystems. In April, the SDA released a detailed specification for the non-security related parts of the SD memory card standard and for the Secure Digital Input Output (SDIO) cards and the standard SD host controller. In January 2009, the SDA announced the SDXC family, which supports cards up to 2 TB and speeds up to 300 MB/s. It features mandatory support for the exFAT filesystem. SDXC was announced at Consumer Electronics Show (CES) 2009 (January 7–10). At the same show, SanDisk and Sony also announced a comparable Memory Stick XC variant with the same 2 TB maximum as SDXC, and Panasonic announced plans to produce 64 GB SDXC cards. On March 6, Pretec introduced the first SDXC card, a 32 GB card with a read/write speed of 400 Mbit/s. But only early in 2010 did compatible host devices come onto the market, including Sony's Handycam HDR-CX55V camcorder, Canon's EOS 550D (also known as Rebel T2i) Digital SLR camera, a USB card reader from Panasonic, and an integrated SDXC card reader from JMicron. The earliest laptops to integrate SDXC card readers relied on a USB 2.0 bus, which does not have the bandwidth to support SDXC at full speed. In early 2010, commercial SDXC cards appeared from Toshiba (64 GB), Panasonic (64 GB and 48 GB), and SanDisk (64 GB). In early 2011, Centon Electronics, Inc. (64 GB and 128 GB) and Lexar (128 GB) began shipping SDXC cards rated at Speed Class 10. Pretec offered cards from 8 GB to 128 GB rated at Speed Class 16. In September 2011, SanDisk released a 64 GB microSDXC card. Kingmax released a comparable product in 2011. In April 2012, Panasonic introduced MicroP2 card format for professional video applications. The cards are essentially full-size SDHC or SDXC UHS-II cards, rated at UHS Speed Class U1. An adapter allows MicroP2 cards to work in current P2 card equipment. Panasonic MicroP2 cards shipped in March 2013 and were the first UHS-II compliant products on market; initial offer includes a 32GB SDHC card and a 64GB SDXC card. 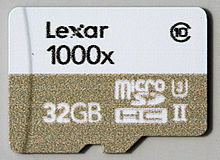 Later that year, Lexar released the first 256 GB SDXC card, based on 20 nm NAND flash technology. In February 2014, SanDisk introduced the first 128 GB microSDXC card, which was followed by a 200 GB microSDXC card in March 2015. September 2014 saw SanDisk announce the first 512 GB SDXC card. Samsung announced the world's first EVO Plus 256 GB microSDXC card in May 2016, and in September 2016 Western Digital announced that a prototype of the first 1 TB SDXC card will be demonstrated at Photokina. In August 2017, SanDisk launched a 400 GB microSDXC card. In January 2018, Integral Memory unveiled 512 GB microSDXC card. In May 2018, PNY launched a 512 GB microSDXC card. In June 2018 Kingston announced the Canvas series for MicroSD cards which both are capable of capabilities up to 512 GB, in three variations, Select, Go!, and React. Secure Digital includes five card families available in three different sizes. The five families are the original Standard-Capacity (SDSC), the High-Capacity (SDHC), the eXtended-Capacity (SDXC), the Ultra-Capacity (SDUC) and the SDIO, which combines input/output functions with data storage. The three form factors are the original size, the mini size, and the micro size. Electrically passive adapters allow a smaller card to fit and function in a device built for a larger card. The SD card's small footprint is an ideal storage medium for smaller, thinner and more portable electronic devices. Asymmetrical shape of the sides of the SD card prevent inserting it upside down (while an MMC goes in most of the way but makes no contact if inverted). Most SD cards are 2.1 mm (0.083 inches) thick, compared to 1.4 mm (0.055 inches) for MMCs. The SD specification defines a card called Thin SD with a thickness of 1.4 mm, but they occur only rarely, as the SDA went on to define even smaller form factors. The card's electrical contacts are recessed beneath the surface of the card, protecting them from contact with a user's fingers. The SD specification envisioned capacities and transfer rates exceeding those of MMC, and both of these functionalities have grown over time. For a comparison table, see below. While MMC uses a single pin for data transfers, the SD card added a four-wire bus mode for higher data rates. The SD card added Content Protection for Recordable Media (CPRM) security circuitry for digital rights management (DRM) content-protection. Full-size SD cards do not fit into the slimmer MMC slots, and other issues also affect the ability to use one format in a host device designed for the other. 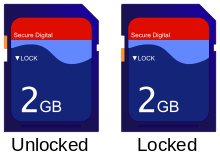 The Secure Digital High Capacity (SDHC) format, announced in January 2006 and defined in version 2.0 of the SD specification, supports cards with capacities up to 32 GB. The SDHC trademark is licensed to ensure compatibility. SDHC cards are physically and electrically identical to standard-capacity SD cards (SDSC). The major compatibility issues between SDHC and SDSC cards are the redefinition of the Card-Specific Data (CSD) register in version 2.0 (see below), and the fact that SDHC cards are shipped preformatted with the FAT32 file system. Version 2.0 also introduces a High-speed bus mode for both SDSC and SDHC cards, which doubles the original Standard Speed clock to produce 25 MB/s. SDHC host devices are required to accept older SD cards. However, older host devices do not recognize SDHC or SDXC memory cards, although some devices can do so through a firmware upgrade. Older Windows operating systems released before Windows 7 require patches or service packs to support access to SDHC cards. The Secure Digital eXtended Capacity (SDXC) format, announced in January 2009 and defined in version 3.01 of the SD specification, supports cards up to 2 TB (2048 GB), compared to a limit of 32 GB for SDHC cards in the SD 2.0 specification. SDXC adopts Microsoft's exFAT file system as a mandatory feature. Version 3.01 also introduced the Ultra High Speed (UHS) bus for both SDHC and SDXC cards, with interface speeds from 50 MB/s to 104 MB/s for four-bit UHS-I bus. Version 4.0, introduced in June 2011, allows speeds of 156 MB/s to 312 MB/s over the four-lane (two differential lanes) UHS-II bus, which requires an additional row of physical pins. Version 5.0 was announced in February 2016 at CP+ 2016, and added "Video Speed Class" ratings for UHS cards to handle higher resolution video formats like 8K. The new ratings define a minimum write speed of 90 MB/s. The Secure Digital Ultra Capacity (SDUC) format, described in the SD 7.0 specification, and announced in June 2018, supports cards up to 128 TB and offers speeds up to 985 MB/s, regardless of form factor, either micro or full size, or interface type including UHS-I, UHS-II, UHS-III or SD Express. The SD Express interface can also be used with SDHC and SDXC cards. SDXC and SDUC cards utilize the exFAT file system, the use of which is governed by a proprietary license, thereby limiting its legal availability to a small set of operating systems. Therefore, exFAT-formatted SDXC cards are not a universally readable exchange medium. Windows Vista (SP1) and later and OS X (10.6.5 and later) support exFAT out of the box. (Windows XP and Server 2003 can support exFAT via an optional update from Microsoft.) Most BSD and Linux distributions do not, for legal reasons; users must manually install third-party implementations of exFAT (as a FUSE module) in order to be able to mount exFAT-formatted volumes. However, SDXC cards can be reformatted to use any file system (such as ext2, UFS, or VFAT), alleviating the restrictions associated with exFAT availability. Except for the change of file system, SDXC cards are mostly backward compatible with SDHC readers, and many SDHC host devices can use SDXC cards if they are first reformatted to the FAT32 file system. Nevertheless, in order to be fully compliant with the SDXC card specification, some SDXC-capable host devices are firmware-programmed to expect exFAT on cards larger than 32 GB. [disputed – discuss] Consequently, they may not accept SDXC cards reformatted as FAT32, even if the device supports FAT32 on smaller cards (for SDHC compatibility). Therefore, even if a file system is supported in general, it is not always possible to use alternative file systems on SDXC cards at all depending on how strictly the SDXC card specification has been implemented in the host device. This bears a risk of accidental loss of data, as a host device may treat a card with an unrecognized file system as blank or damaged and reformat the card. The SD Association provides a formatting utility for Windows and Mac OS X that checks and formats SD, SDHC, SDXC, and SDUC cards. SD card speed is customarily rated by its sequential read or write speed. The sequential performance aspect is the most relevant for storing and retrieving large files (relative to block sizes internal to the flash memory), such as images and multimedia. Small data (such as file names, sizes and timestamps) falls under the much lower speed limit of random access, which can be the limiting factor in some use cases. With early SD cards, a few card manufacturers specified the speed as a "times" ("×") rating, which compared the average speed of reading data to that of the original CD-ROM drive. This was superseded by the Speed Class Rating, which guarantees a minimum rate at which data can be written to the card. The newer families of SD card improve card speed by increasing the bus rate (the frequency of the clock signal that strobes information into and out of the card). Whatever the bus rate, the card can signal to the host that it is "busy" until a read or a write operation is complete. Compliance with a higher speed rating is a guarantee that the card limits its use of the "busy" indication. Specified in SD version 3.01. Supports a clock frequency of 100 MHz (a quadrupling of the original "Default Speed"), which in four-bit transfer mode could transfer 50 MB/s (SDR50). UHS-I cards declared as UHS104 (SDR104) also support a clock frequency of 208 MHz, which could transfer 104 MB/s. Double data rate operation at 50 MHz (DDR50) is also specified in Version 3.01, and is mandatory for microSDHC and microSDXC cards labeled as UHS-I. In this mode, four bits are transferred when the clock signal rises and another four bits when it falls, transferring an entire byte on each full clock cycle, hence a 50 MB/s operation could be transferred using a 50 MHz clock. Specified in version 4.0, further raises the data transfer rate to a theoretical maximum of 156 MB/s (full-duplex) or 312 MB/s (half-duplex) using an additional row of pins (a total of 17 pins for full-size and 16 pins for micro-size cards). Version 6.0, released in February 2017, added two new data rates to the standard. FD312 provides 312 MB/s while FD624 doubles that. Both are full-duplex. The physical interface and pin-layout are the same as with UHS-II, retaining backward compatibility. Cards that comply with UHS show Roman numerals 'I', 'II' or 'III' next to the SD card logo, and report this capability to the host device. Use of UHS-I requires that the host device command the card to drop from 3.3-volt to 1.8-volt operation over the I/O interface pins and select the four-bit transfer mode, while UHS-II requires 0.4-volt operation. The higher speed rates are achieved by using a two-lane low voltage (0.4 V pp) differential interface. Each lane is capable of transferring up to 156 MB/s. In full-duplex mode, one lane is used for Transmit while the other is used for Receive. In half-duplex mode both lanes are used for the same direction of data transfer allowing a double data rate at the same clock speed. In addition to enabling higher data rates, the UHS-II interface allows for lower interface power consumption, lower I/O voltage and lower electromagnetic interference (EMI). 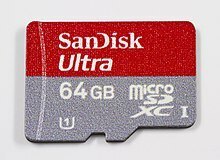 In February 2019, the SD Association announced the microSD Express. 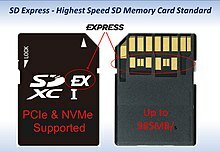 The microSD Express cards offer PCI Express and NVMe interfaces, as the June 2018 SD Express release did, alongside the legacy microSD interface for continued backwards compatibility. The SDA also released visual marks to denote microSD Express memory cards to make matching the card and device easier for optimal device performance. The most important advice[according to whom?] to consumers is to continue to match SD card purchases to an application's recommended speed class. Applications that require a specific speed class usually specify this in their user manuals. The SD Association defines three types of Speed Class ratings: the original Speed Class, UHS Speed Class, and Video Speed Class. Speed Class ratings 2, 4, and 6 assert that the card supports the respective number of megabytes per second as a minimum sustained write speed for a card in a fragmented state. Class 10 asserts that the card supports 10 MB/s as a minimum non-fragmented sequential write speed and uses a High Speed bus mode. The host device can read a card's speed class and warn the user if the card reports a speed class that falls below an application's minimum need. By comparison, the older "×" rating measured maximum speed under ideal conditions, and was vague as to whether this was read speed or write speed. The graphical symbol for the speed class has a number encircled with 'C' (C2, C4, C6, and C10). UHS-I and UHS-II cards can use UHS Speed Class rating with two possible grades: class 1 for minimum read/write performance of at least 10 MB/s ('U1' symbol featuring number 1 inside 'U') and class 3 for minimum write performance of 30 MB/s ('U3' symbol featuring 3 inside 'U'), targeted at recording 4K video. Before November 2013, the rating was branded UHS Speed Grade and contained grades 0 (no symbol) and 1 ('U1' symbol). Manufacturers can also display standard speed class symbols (C2, C4, C6, and C10) alongside, or in place of UHS speed class. UHS memory cards work best with UHS host devices. The combination lets the user record HD resolution videos with tapeless camcorders while performing other functions. It is also suitable for real-time broadcasts and capturing large HD videos. Video Speed Class defines a set of requirements for UHS cards to match the modern MLC NAND flash memory and supports progressive 4K and 8K video with minimum sequential writing speeds of 6-90 MB/s. The graphical symbols use 'V' followed by a number designating write speed (V6, V10, V30, V60, and V90). Application Performance Class is a newly defined standard from the SD Specification 5.1 and 6.0 which not only define sequential Reading Speeds but also mandates a minimum IOPS for reading and writing. Class A1 requires a minimum of 1500 reading and 500 writing operations per second, while class A2 requires 4000 and 2000 IOPS. The "×" rating, that was used by some card manufacturers and made obsolete by speed classes, is a multiple of the standard CD-ROM drive speed of 150 KiB/s (approximately 1.23 Mbit/s). Basic cards transfer data at up to six times (6×) the CD-ROM speed; that is, 900 KiB/s or 7.37 Mbit/s. The 2.0 specification[clarification needed] defines speeds up to 200×, but is not as specific as Speed Classes are on how to measure speed. Manufacturers may report best-case speeds and may report the card's fastest read speed, which is typically faster than the write speed. Some vendors, including Transcend and Kingston, report their cards' write speed. When a card lists both a speed class and an "×" rating, the latter may be assumed a read speed only. In applications that require sustained write throughput, such as video recording, the device might not perform satisfactorily if the SD card's class rating falls below a particular speed. For example, a high-definition camcorder may require a card of not less than Class 6, suffering dropouts or corrupted video if a slower card is used. Digital cameras with slow cards may take a noticeable time after taking a photograph before being ready for the next, while the camera writes the first picture. Write amplification: The flash controller may need to overwrite more data than requested. This has to do with performing read-modify-write operations on write blocks, freeing up (the much larger) erase blocks, while moving data around to achieve wear leveling. File fragmentation: where there is not sufficient space for a file to be recorded in a contiguous region, it is split into non-contiguous fragments. This does not cause rotational or head-movement delays as with electromechanical hard drives, but may decrease speed⁠ ⁠ ⁠― for instance, by requiring additional reads and computation to determine where on the card the file's next fragment is stored. In addition, speed may vary markedly between writing a large amount of data to a single file (sequential access, as when a digital camera records large photographs or videos) and writing a large number of small files (a random-access use common in smartphones). A study in 2012 found that, in this random-access use, some Class 2 cards achieved a write speed of 1.38 MB/s, while all cards tested of Class 6 or greater (and some of lower Classes; lower Class does not necessarily mean better small-file performance), including those from major manufacturers, were over 100 times slower. In 2014, a blogger measured a 300-fold performance difference on small writes; this time, the best card in this category was a class 4 card. Cards can protect their contents from erasure or modification, prevent access by non-authorized users, and protect copyrighted content using digital rights management. The host device can command the SD card to become read-only (to reject subsequent commands to write information to it). There are both reversible and irreversible host commands that achieve this. 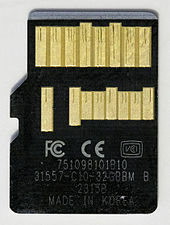 Most full-size SD cards have a "mechanical write protect switch" allowing the user to advise the host computer that the user wants the device to be treated as read-only. This does not protect the data on the card if the host is compromised: "It is the responsibility of the host to protect the card. The position of the write protect switch is unknown to the internal circuitry of the card." The switch is a sliding tab that covers a notch in the card. The miniSD and microSD formats do not directly support a write protection notch, but they can be inserted into full-size adapters which do. When looking at the SD card from the top, the right side (the side with the beveled corner) must be notched. On the left side, there may be a write-protection notch. If the notch is omitted, the card can be read and written. If the card is notched, it is read-only. If the card has a notch and a sliding tab which covers the notch, the user can slide the tab upward (toward the contacts) to declare the card read/write, or downward to declare it read-only. The diagram to the right shows an orange sliding write-protect tab in both the unlocked and locked positions. The presence of a notch, and the presence and position of a tab, have no effect on the SD card's internal operation. Rather, it relies on the host. A host device that supports write protection should refuse to write to an SD card that is designated read-only in this way. Some host devices do not support write protection, which is an optional feature of the SD specification. Drivers and devices that do obey a read-only indication may give the user a way to override it. Cards sold with content that must not be altered are permanently marked read-only by having a notch and no sliding tab. A host device can lock an SD card using a password of up to 16 bytes, typically supplied by the user. A locked card interacts normally with the host device except that it rejects commands to read and write data. A locked card can be unlocked only by providing the same password. The host device can, after supplying the old password, specify a new password or disable locking. Without the password (typically, in the case that the user forgets the password), the host device can command the card to erase all the data on the card for future re-use (except card data under DRM), but there is no way to gain access to the existing data. Windows Phone 8 devices use SD cards designed for access only by the phone manufacturer or mobile provider. 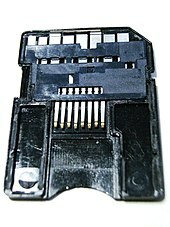 An SD card inserted into the phone underneath the battery compartment becomes locked "to the phone with an automatically generated key" so that "the SD card cannot be read by another phone, device, or PC". Symbian devices, however, are some of the few that can perform the necessary low-level format operations on locked SD cards. It is therefore possible to use a device such as the Nokia N8 to reformat the card for subsequent use in other devices. A smartSD memory card is a microSD card with an internal "secure element" that allows the transfer of ISO 7816 Application Protocol Data Unit commands to, for example, JavaCard applets running on the internal secure element through the SD bus. Various implementations of smartSD cards have been done for payment applications and secured authentication. microSD cards with Secure Element and NFC (near field communication) support are used for payment and secure access. Integrated Wi-Fi – Several companies produce SD cards with built-in Wi-Fi transceivers supporting static security (WEP 40; 104; and 128, WPA-PSK, and WPA2-PSK). The card lets any digital camera with an SD slot transmit captured images over a wireless network, or store the images on the card's memory until it is in range of a wireless network. Examples include: Eye-Fi / SanDisk, Transcend Wi-Fi, Toshiba FlashAir, Trek Flucard, PQI Air Card and LZeal ez Share. Some models geotag their pictures. Pre-loaded content – In 2006, SanDisk announced Gruvi, a microSD card with extra digital rights management features, which they intended as a medium for publishing content. SanDisk again announced pre-loaded cards in 2008, under the slotMusic name, this time not using any of the DRM capabilities of the SD card. In 2011, SanDisk offered various collections of 1000 songs on a single slotMusic card for about $40, now restricted to compatible devices and without the ability to copy the files. Integrated USB connector – The SanDisk SD Plus product can be plugged directly into a USB port without needing a USB card reader. Other companies introduced comparable products, such as the Duo SD product of OCZ Technology and the 3 Way (microSDHC, SDHC, and USB) product of A-DATA, which was available in 2008 only. 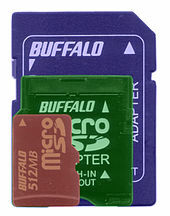 Different colors – SanDisk has used various colors of plastic or adhesive label, including a "gaming" line in translucent plastic colors that indicated the card's capacity. Integrated display – In 2006, A-DATA announced a Super Info SD card with a digital display that provided a two-character label and showed the amount of unused memory on the card. A SDIO (Secure Digital Input Output) card is an extension of the SD specification to cover I/O functions. SDIO cards are only fully functional in host devices designed to support their input-output functions (typically PDAs like the Palm Treo, but occasionally laptops or mobile phones). These devices can use the SD slot to support GPS receivers, modems, barcode readers, FM radio tuners, TV tuners, RFID readers, digital cameras, and interfaces to Wi-Fi, Bluetooth, Ethernet, and IrDA. Many other SDIO devices have been proposed, but it is now more common for I/O devices to connect using the USB interface. SDIO cards support most of the memory commands of SD cards. SDIO cards can be structured as eight logical cards, although currently, the typical way that an SDIO card uses this capability is to structure itself as one I/O card and one memory card. The SDIO family comprises Low-Speed and Full-Speed cards. Both types of SDIO cards support SPI and one-bit SD bus types. Low-Speed SDIO cards are allowed to also support the four-bit SD bus; Full-Speed SDIO cards are required to support the four-bit SD bus. To use an SDIO card as a "combo card" (for both memory and I/O), the host device must first select four-bit SD bus operation. Two other unique features of Low-Speed SDIO are a maximum clock rate of 400 kHz for all communications, and the use of Pin 8 as "interrupt" to try to initiate dialogue with the host device. The one-bit SD protocol was derived from the MMC protocol, which envisioned the ability to put up to three cards on a bus of common signal lines. The cards use open collector interfaces, where a card may pull a line to the low voltage level; the line is at the high voltage level (because of a pull-up resistor) if no card pulls it low. Though the cards shared clock and signal lines, each card had its own chip select line to sense that the host device had selected it. The SD protocol envisioned the ability to gang 30 cards together without separate chip select lines. The host device would broadcast commands to all cards and identify the card to respond to the command using its unique serial number. In practice, cards are rarely ganged together because open-collector operation has problems at high speeds and increases power consumption. Newer versions of the SD specification recommend separate lines to each card. Host devices that comply with newer versions of the specification provide backward compatibility and accept older SD cards. For example, SDXC host devices accept all previous families of SD memory cards, and SDHC host devices also accept standard SD cards. ^ The necessary recording and playback speed class requirements may vary by device. Secure Digital cards are used in many consumer electronic devices, and have become a widespread means of storing several gigabytes of data in a small size. Devices in which the user may remove and replace cards often, such as digital cameras, camcorders, and video game consoles, tend to use full-sized cards. Devices in which small size is paramount, such as mobile phones, tend to use microSD cards. The microSD card has helped propel the smartphone market by giving both manufacturers and consumers greater flexibility and freedom. [according to whom?] Due to their compact size, microSD cards are used in many[which?] different applications in a large variety[which?] of markets. 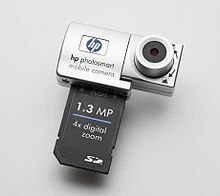 Action cameras, such as the GoPRO's Hero and cameras in drones, frequently use microSD cards. Recent versions of major operating systems such as Windows Mobile and Android allow applications to run from microSD cards, creating possibilities for new usage models for SD cards in mobile computing markets. SD cards are not the most economical solution in devices that need only a small amount of non-volatile memory, such as station presets in small radios. They may also not present the best choice for applications that require higher storage capacities or speeds as provided by other flash card standards such as CompactFlash. These limitations may be addressed by evolving memory technologies, such as the new SD 7.0 specifications which allow storage capabilities of up to 128 TB. Samsung Pro 64 GB microSDXC original (left) and counterfeit (right): The counterfeit claims to have 64 GB in capacity, but only 8 GB (Class 4 speed) are usable: When trying to write more than 8 GB, data loss occurs. Also used for SanDisk 64 GB fakes. 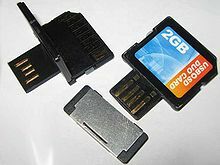 Many personal computers of all types, including tablets and mobile phones, use SD cards, either through built-in slots or through an active electronic adapter. Adapters exist for the PC card, ExpressBus, USB, FireWire, and the parallel printer port. Active adapters also let SD cards be used in devices designed for other formats, such as CompactFlash. The FlashPath adapter lets SD cards be used in a floppy disk drive. Images of genuine, questionable, and fake/counterfeit microSD (Secure Digital) cards before and after decapsulation. Details at source, photo by Andrew Huang. Commonly found on the market are mislabeled or counterfeit Secure Digital cards that report a fake capacity or run slower than labeled. Software tools exist to check and detect counterfeit products. Detection of counterfeit cards usually involves copying files with random data to the SD card until the card's capacity is reached, and copying them back. The files that were copied back can be tested either by comparing checksums (e.g. MD5), or trying to compress them. The latter approach leverages the fact that counterfeited cards let the user read back files, which then consist of easily compressible uniform data (for example, repeating 0xFFs). SD/MMC cards replaced Toshiba's SmartMedia as the dominant memory card format used in digital cameras. In 2001, SmartMedia had achieved nearly 50% use, but by 2005 SD/MMC had achieved over 40% of the digital camera market and SmartMedia's share had plummeted by 2007. At this time, all the leading digital camera manufacturers used SD in their consumer product lines, including Canon, Casio, Fujifilm, Kodak, Leica, Nikon, Olympus, Panasonic, Pentax, Ricoh, Samsung, and Sony. Formerly, Olympus and Fujifilm used XD-Picture Cards (xD cards) exclusively, while Sony only used Memory Stick; by early 2010 all three supported SD. 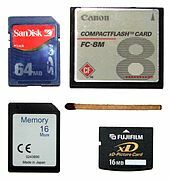 Some prosumer and professional digital cameras continued to offer CompactFlash (CF), either on a second card slot or as the only storage, as CF supports much higher maximum capacities and historically was cheaper for the same capacity. Secure Digital memory cards can be used in Sony XDCAM EX camcorders with an adapter and in Panasonic P2 card equipment with a MicroP2 adapter. Although many personal computers accommodate SD cards as an auxiliary storage device using a built-in slot, or can accommodate SD cards by means of a USB adapter, SD cards cannot be used as the primary hard disk through the onboard ATA controller, because none of the SD card variants support ATA signalling. Primary hard disk use requires a separate SD controller chip or an SD-to-CompactFlash converter. However, on computers that support bootstrapping from a USB interface, an SD card in a USB adapter can be the primary hard disk, provided it contains an operating system that supports USB access once the bootstrap is complete. Since late 2009, newer Apple computers with installed SD card readers have been able to boot in macOS from SD storage devices, when properly formatted to Mac OS Extended file format and the default partition table set to GUID Partition Table. (See Other file systems below). SD cards are increasing in usage and popular among owners of vintage computers like 8-bit Atari. For example SIO2SD (SIO is Atari port for connecting external devices) are used nowadays. It may be interesting fact that probably whole software for 8 bit Atari may be included on one SD card that have less than 4-8 GB of disk size(2019). In 2008, the SDA specified Embedded SD, "leverag[ing] well-known SD standards" to enable non-removable SD-style devices on printed circuit boards. However this standard was not adopted by the market while the MMC standard became the de facto standard for embedded systems. SanDisk provides such embedded memory components under the iNAND brand. Most modern microcontrollers have built-in SPI logic that can interface to an SD card operating in its SPI mode, providing non-volatile storage. Even if a microcontroller lacks the SPI feature, the feature can be emulated by bit banging. For example, a home-brew hack combines spare General Purpose Input/Output (GPIO) pins of the processor of the Linksys WRT54G router with MMC support code from the Linux kernel. This technique can achieve throughput of up to 1.6 Mbit/s. Prerecorded MicroSDs have been used to commercialize music under the brands slotMusic and slotRadio by SanDisk and MQS by Astell&Kern. The SD card specification defines three physical sizes. The SD and SDHC families are available in all three sizes, but the SDXC and SDUC families are not available in the mini size, and the SDIO family is not available in the micro size. Smaller cards are usable in larger slots through use of a passive adapter. Cards may support various combinations of the following bus types and transfer modes. The SPI bus mode and one-bit SD bus mode are mandatory for all SD families, as explained in the next section. Once the host device and the SD card negotiate a bus interface mode, the usage of the numbered pins is the same for all card sizes. SPI bus mode: Serial Peripheral Interface Bus is primarily used by embedded microcontrollers. This bus type supports only a 3.3-volt interface. This is the only bus type that does not require a host license. One-bit SD bus mode: Separate command and data channels and a proprietary transfer format. Four-bit SD bus mode: Uses extra pins plus some reassigned pins. This is the same protocol as the one-bit SD bus mode which uses one command and four data lines for faster data transfer. All SD cards support this mode. UHS-I and UHS-II require this bus type. Two differential lines SD UHS-II mode: Uses two low-voltage differential interfaces to transfer commands and data. UHS-II cards include this interface in addition to the SD bus modes. The physical interface comprises 9 pins, except that the miniSD card adds two unconnected pins in the center and the microSD card omits one of the two VSS (Ground) pins. Official pin numbers for each card type (top to bottom): MMC, SD, miniSD, microSD. This shows the evolution from the older MMC, on which SD is based. NOTE: This drawing doesn't show 8 new UHS-II contacts that were added in spec 4.0. Direction is relative to card. I = Input, O = Output. PP = Push-Pull logic, OD = Open-Drain logic. S = Power Supply, NC = Not Connected (or logical high). SD cards and host devices initially communicate through a synchronous one-bit interface, where the host device provides a clock signal that strobes single bits in and out of the SD card. The host device thereby sends 48-bit commands and receives responses. The card can signal that a response will be delayed, but the host device can abort the dialogue. Prepare the card to receive a block to write to the flash memory, or read and reply with the contents of a specified block. The command interface is an extension of the MultiMediaCard (MMC) interface. SD cards dropped support for some of the commands in the MMC protocol, but added commands related to copy protection. By using only commands supported by both standards until determining the type of card inserted, a host device can accommodate both SD and MMC cards. All SD card families initially use a 3.3 volt electrical interface. On command, SDHC and SDXC cards can switch to 1.8 V operation. At initial power-up or card insertion, the host device selects either the Serial Peripheral Interface (SPI) bus or the one-bit SD bus by the voltage level present on Pin 1. Thereafter, the host device may issue a command to switch to the four-bit SD bus interface, if the SD card supports it. For various card types, support for the four-bit SD bus is either optional or mandatory. After determining that the SD card supports it, the host device can also command the SD card to switch to a higher transfer speed. Until determining the card's capabilities, the host device should not use a clock speed faster than 400 kHz. SD cards other than SDIO (see below) have a "Default Speed" clock rate of 25 MHz. The host device is not required to use the maximum clock speed that the card supports. It may operate at less than the maximum clock speed to conserve power. Between commands, the host device can stop the clock entirely. The SD specification defines four-bit-wide transfers. (The MMC specification supports this and also defines an eight-bit-wide mode; MMC cards with extended bits were not accepted by the market.) Transferring several bits on each clock pulse improves the card speed. Advanced SD families have also improved speed by offering faster clock frequencies and double data rate (explained here) in a high-speed differential interface (UHS-II). Like other types of flash memory card, an SD card of any SD family is a block-addressable storage device, in which the host device can read or write fixed-size blocks by specifying their block number. Most consumer products that take an SD card expect that it is partitioned and formatted in this way. Universal support for FAT12, FAT16, FAT16B, and FAT32 allows the use of SDSC and SDHC cards on most host computers with a compatible SD reader, to present the user with the familiar method of named files in a hierarchical directory tree. On such SD cards, standard utility programs such as Mac OS X's "Disk Utility" or Windows' SCANDISK can be used to repair a corrupted filing system and sometimes recover deleted files. Defragmentation tools for FAT file systems may be used on such cards. The resulting consolidation of files may provide a marginal improvement in the time required to read or write the file, but not an improvement comparable to defragmentation of hard drives, where storing a file in multiple fragments requires additional physical, and relatively slow, movement of a drive head. Moreover, defragmentation performs writes to the SD card that count against the card's rated lifespan. The write endurance of the physical memory is discussed in the article on flash memory; newer technology to increase the storage capacity of a card provides worse write endurance. When reformatting an SD card with a capacity of at least 32 MB (65536 logical sectors or more), but not more than 2 GB, FAT16B with partition type 06h and EBPB 4.1 is recommended if the card is for a consumer device. (FAT16B is also an option for 4 GB cards, but it requires the use of 64 kiB clusters, which are not widely supported.) FAT16B does not support cards above 4 GB at all. The SDXC specification mandates the use of Microsoft's proprietary exFAT file system, which sometimes requires appropriate drivers (e.g. exfat-utils/exfat-fuse on Linux). Under Windows, SD cards can be formatted using NTFS and, on later versions, exFAT. Under macOS, SD cards can be partitioned as GUID devices and formatted with either HFS Plus or APFS file systems or still use exFAT. Any recent version of the above can format SD cards using the UDF file system. Additionally, as with live USB flash drives, an SD card can have an operating system installed on it. Computers that can boot from an SD card (either using a USB adapter or inserted into the computer's flash media reader) instead of the hard disk drive may thereby be able to recover from a corrupted hard disk drive. Such an SD card can be write-locked to preserve the system's integrity. The SD Standard allows usage of only the above-mentioned Microsoft FAT file systems and any card produced in the market shall be preloaded with the related standard file system upon its delivery to the market. If any application or user re-formats the card with a non-standard file system the proper operation of the card, including interoperability, cannot be assured. Reformatting an SD card with a different file system, or even with the same one, may make the card slower, or shorten its lifespan. Some cards use wear leveling, in which frequently modified blocks are mapped to different portions of memory at different times, and some wear-leveling algorithms are designed for the access patterns typical of FAT12, FAT16 or FAT32. In addition, the preformatted file system may use a cluster size that matches the erase region of the physical memory on the card; reformatting may change the cluster size and make writes less efficient. The SD Association provides freely-downloadable SD Formatter software to overcome these problems for Windows and Mac OS X.
SD/SDHC/SDXC memory cards have a "Protected Area" on the card for the SD standard's security function. Neither standard formatters nor the SD Association formatter will erase it. The SD Association suggests that devices or software which use the SD security function may format it. The power consumption of SD cards varies by its speed mode, manufacturer and model. During transfer it may be in the range of 66–330 mW (20–100 mA at a supply voltage of 3.3 V). Specifications from TwinMos technologies list a maximum of 149 mW (45 mA) during transfer. Toshiba lists 264–330 mW (80–100 mA). Standby current is much lower, less than 0.2 mA for one 2006 microSD card. If there is data transfer for significant periods, battery life may be reduced noticeably (smartphones typically have batteries of capacity around 6 Wh (Samsung Galaxy S2, 1650 mAh @ 3.7 V)). Modern UHS-II cards can consume up to 2.88 W, if the host device supports bus speed mode SDR104 or UHS-II. Minimum power consumption in the case of a UHS-II host is 720 mW. All SD cards let the host device determine how much information the card can hold, and the specification of each SD family gives the host device a guarantee of the maximum capacity a compliant card reports. By the time the version 2.0 (SDHC) specification was completed in June 2006, vendors had already devised 2 GB and 4 GB SD cards, either as specified in Version 1.01, or by creatively reading Version 1.00. The resulting cards do not work correctly in some host devices. A host device can ask any inserted SD card for its 128-bit identification string (the Card-Specific Data or CSD). In standard-capacity cards (SDSC), 12 bits identify the number of memory clusters (ranging from 1 to 4,096) and 3 bits identify the number of blocks per cluster (which decode to 4, 8, 16, 32, 64, 128, 256, or 512 blocks per cluster). The host device multiplies these figures (as shown in the following section) with the number of bytes per block to determine the card's capacity in bytes. SD version 1.00 assumed 512 bytes per block. This permitted SDSC cards up to 4,096 × 512 × 512 = 1 GB, for which there are no known incompatibilities. Version 1.01 let an SDSC card use a 4-bit field to indicate 1,024 or 2,048 bytes per block instead. Doing so enabled cards with 2 GB and 4 GB capacity, such as the Transcend 4 GB SD card and the Memorette 4GB SD card. Early SDSC host devices that assume 512-byte blocks therefore do not fully support the insertion of 2 GB or 4 GB cards. In some cases, the host device can read data that happens to reside in the first 1 GB of the card. If the assumption is made in the driver software, success may be version-dependent. In addition, any host device might not support a 4 GB SDSC card, since the specification lets it assume that 2 GB is the maximum for these cards. The format of the Card-Specific Data (CSD) register changed between version 1 (SDSC) and version 2.0 (which defines SDHC and SDXC). Later versions state (at Section 4.3.2) that a 2 GB SDSC card shall set its READ_BL_LEN (and WRITE_BL_LEN) to indicate 1024 bytes, so that the above computation correctly reports the card's capacity; but that, for consistency, the host device shall not request (by CMD16) block lengths over 512bytes. In the definition of SDHC cards in version 2.0, the C_SIZE portion of the CSD is 22 bits and it indicates the memory size in multiples of 512 KB (the C_SIZE_MULT field is removed and READ_BL_LEN is no longer used to compute capacity). Two bits that were formerly reserved now identify the card family: 0 is SDSC; 1 is SDHC or SDXC; 2 and 3 are reserved. Because of these redefinitions, older host devices do not correctly identify SDHC or SDXC cards nor their correct capacity. SDHC cards are restricted to reporting a capacity not over 32 GB. SDXC cards are allowed to use all 22 bits of the C_SIZE field. An SDHC card that did so (reported C_SIZE > 65375 to indicate a capacity of over 32 GB) would violate the specification. A host device that relied on C_SIZE rather than the specification to determine the card's maximum capacity might support such a card, but the card might fail in other SDHC-compatible host devices. Capacities above 4 GB can only be achieved by following version 2.0 or later versions. In addition, capacities equal to 4 GB must also do so to guarantee compatibility. Early versions of the SD specification were available under a non-disclosure agreement (NDA) prohibiting development of open-source drivers. However, the system was eventually reverse-engineered and free software drivers provided access to SD cards not using DRM. Subsequent to the release of most open-source drivers, the SDA provided a simplified version of the specification under a less restrictive license helping reduce some incapability issues. Under a disclaimers agreement, the simplified specification released by the SDA in 2006 – as opposed to that of SD cards – which later extended to the physical layer, ASSD extensions, SDIO, and SDIO Bluetooth Type-A. Again, most of the information had already been discovered and Linux had a fully free driver for it. Still, building a chip conforming to this specification caused the One Laptop per Child project to claim "the first truly Open Source SD implementation, with no need to obtain an SDI license or sign NDAs to create SD drivers or applications." The proprietary nature of the complete SD specification affects embedded systems, laptop computers, and some desktop computers; many desktop computers do not have card slots, instead using USB-based card readers if necessary. These card readers present a standard USB mass storage interface to memory cards, thus separating the operating system from the details of the underlying SD interface. However, embedded systems (such as portable music players) usually gain direct access to SD cards and thus need complete programming information. Desktop card readers are themselves embedded systems; their manufacturers have usually paid the SDA for complete access to the SD specifications. Many notebook computers now include SD card readers not based on USB; device drivers for these essentially gain direct access to the SD card, as do embedded systems. The SPI-bus interface mode is the only type that does not require a host license for accessing SD cards. However, SD is much more open than Sony's Memory Stick, for which no public documentation nor any documented legacy implementation is available. All SD cards can be accessed freely using the well-documented SPI bus. xD cards are simply 18-pin NAND flash chips in a special package and support the standard command set for raw NAND flash access. Although the raw hardware interface to xD cards is well understood, the layout of its memory contents—necessary for interoperability with xD card readers and digital cameras—is totally undocumented. The consortium that licenses xD cards has not released any technical information to the public. Table data compiled from MMC, SD, and SDIO specifications from SD Association and JEDEC web sites. Data for other card variations are interpolated. A malfunctioning SD card can be repaired using specialized equipment, as long as the middle part, containing the flash storage, is not physically damaged. The controller can in this way be circumvented. This might be harder or even impossible in the case of monolithic card, where the controller resides on the same physical die. ^ "Matsushita Electric, SanDisk and Toshiba Agree to Join Forces to Develop and Promote Next Generation Secure Memory Card". DP Review. 1999-08-24. Retrieved 2016-02-23. ^ "Welcome to SD-3C, LLC". SD-3C. 2015-03-30. Retrieved 2016-02-23. ^ "Matsushita Electric, SanDisk and Toshiba to Form SD Association to Promote Next Generation SD Memory Card". Toshiba. 2015-03-30. Retrieved 2016-02-23. ^ "Using SD Memory Cards is Easy". SD Association. 2010-06-22. Retrieved 2014-01-02. ^ "Three Giants to develop new "Secure Memory Card"". DP review. Retrieved 2016-02-23. ^ "Press Releases 17 July 2003". Toshiba. 2003-07-17. Retrieved 2010-08-22. ^ "PhoneScoop – Sandisk T-Flash announcement". Phonescoop.com. Retrieved 2014-01-02. ^ "SanDisk and Sony to expand Memory Stick Pro and Memory Stick Micro formats". SanDisk. 2009-01-07. Retrieved 2010-08-22. ^ "SD Card, Memory Stick formats to reach 2 terabytes, but when?". Beta news. 2009-01-08. ^ "Pretec introduces world's first SDXC card". Digital Photography Review. 2009-03-06. Retrieved 2010-08-22. ^ "Canon EOS Rebel T2i/550D Digital SLR Camera Review". The Digital Picture. ^ Ng, Jansen (2009-11-24). "Lack of Card Readers Holding Back SDXC Flash Memory Adoption". DailyTech. Retrieved 2009-12-22. ^ Ng, Jansen (2009-11-30). "Lenovo, HP, Dell Integrating SDXC Readers in New 32nm Intel "Arrandale" Laptops". DailyTech. Retrieved 2009-12-22. ^ Ng, Jansen (2009-12-22). "Toshiba Sampling First SDXC Flash Memory Cards". DailyTech. Retrieved 2009-12-22. ^ "Toshiba's 64 GB SDXC card to finally go on sale (in Japan)". CrunchGear. Retrieved 2010-08-09. ^ "Panasonic Introduces New 64 GB* and 48 GB* SDXC Memory Cards, Available Globally in February 2010". Panasonic. Retrieved 2010-08-09. ^ "Sandisk ships its highest capacity sd card ever". SanDisk. 2010-02-22. Retrieved 2010-08-09. ^ "Lexar ships 128 GB Class 10 SDXC card; March 2011". Betanews.com. 2011-03-16. Retrieved 2014-01-02. ^ "SDXC/SDHC 433X Class 16 Card from Pretec". Pretec. 2011-06-13. Retrieved 2010-12-03. ^ a b "For Journalists". .panasonic.com. 2013-03-20. Archived from the original on 2013-05-26. Retrieved 2014-01-02. ^ "microP2 Card | P2 Series | Broadcast and Professional AV". Pro-av.panasonic.net. Retrieved 2014-01-02. ^ Lawler, Richard (2012-04-15). "Panasonic introduces new microP2 SD-sized storage at NAB 2012". Engadget.com. Retrieved 2014-01-02. ^ Renée, V. "Panasonic's New Smaller, Faster, and Lower-Cost MicroP2 Cards Coming in April, Starting at $250 « No Film School". Nofilmschool.com. Retrieved 2014-01-02. ^ "Lexar Announces Industry's First 256 GB SDXC UHS-I Memory Card". Micron. Retrieved 22 December 2012. ^ SanDisk®. "SANDISK INTRODUCES WORLD'S HIGHEST CAPACITY microSDXC MEMORY CARD AT 128GB". www.sandisk.com. ^ "SanDisk introduces the first 200GB microSDXC card". SanDisk.com. 2014-02-24. Retrieved 2016-06-06. ^ SanDisk®. "SanDisk Premieres World's Highest Capacity SD Card for High Performance Video and Photo Capture". www.sandisk.com. Retrieved 2016-09-20. ^ "Samsung Electronics Introduces the EVO Plus 256 GB MicroSD Card, with the Highest Capacity in its Class". news.samsung.com. 2016-05-10. Retrieved 2016-06-06. ^ SanDisk®. "Western Digital Demonstrates Prototype of the World's First 1Terabyte SDXC Card". www.sandisk.com. Retrieved 2016-09-20. ^ Shilov, Anton. "Western Digital Launches SanDisk Ultra microSD Card with 400 GB Capacity". ^ Integral Memory. "Integral Memory's new 512GB microSD card is the biggest microSD card yet". www.theverge.com. Retrieved 2018-06-10. ^ Kingston. "Kingston Digital Announces New 'Canvas' Series of Flash Cards". Kingston Technology Europe Co LLP. Retrieved 2018-11-19. ^ a b "Capacity". SD Association. Retrieved 2011-12-08. ^ a b "Using SDXC". SD Association. Retrieved 2011-12-08. ^ "SDIO". SD Association. Retrieved 2011-12-08. ^ Bus Speed (Default Speed/ High Speed/ UHS) SDcard. ^ a b About Compatibility with Host Devices Archived 2011-11-21 at the Wayback Machine SD Association. ^ What's new in Firmware 2.41 Beta (for COWON D2) JetAudio. ^ "934428 – Hotfix for Windows XP that adds support for SDHC cards that have a capacity of more than 4 GB". Support. Microsoft. 2008-02-15. Retrieved 2010-08-22. ^ "939772 – Some Secure Digital (SD) cards may not be recognized in Windows Vista". Support. Microsoft. 2008-05-15. Retrieved 2010-08-22. 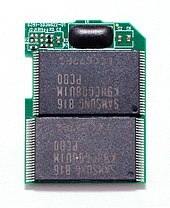 ^ "949126 – A Secure Digital High Capacity (SDHC) card is not recognized on a Windows Vista Service Pack 1-based computer". Support. Microsoft. 2008-02-21. Retrieved 2010-08-22. ^ "Capacity (SD/SDHC/SDXC) - SD Association". www.sdcard.org. Retrieved 2017-03-20. ^ a b "Bus Speed (Default Speed/ High Speed/ UHS) - SD Association". www.sdcard.org. Retrieved 20 March 2017. ^ a b "NEW SD ASSOCIATION VIDEO SPEED CLASS SUPPORTS 8K AND MULTI-FILE VIDEO RECORDING" (PDF). SD Association. 2016-02-26. ^ Shilov, Anton (2016-03-01). "SD Association Announces SD 5.0 Specification: SD Cards For UHD and 360° Video Capture". Anand Tech. ^ a b "Video Speed Class: The new capture protocol of SD 5.0" (PDF). SD Association. February 2016. ^ Chaundy, Fabian (2016-02-26). "New Video Speed Class for SD Cards". cinema5D. ^ "SD Express Cards with PCIe® and NVMeTM Interfaces" (PDF). SD Association. June 2018. Retrieved 21 November 2018. ^ "Notable Changes in Windows Vista Service Pack 1". Microsoft. Microsoft. Retrieved 28 November 2015. ^ "About the SD and SDXC card slots". Apple Inc. 2011-05-03. Retrieved 2011-09-05. ^ "Apple released exFAT support in OS X 10.6.5 update". Tuxera.com. 2010-11-22. Retrieved 2012-01-04. ^ WindowsXP-KB955704-x86-ENU.exe (2011-10-08). "Description of the exFAT file system driver update package". Microsoft.com. Retrieved 2015-11-27. ^ "exFAT for BSD and Linux systems from Google Code". Code.google.com. Retrieved 2014-01-02. ^ deKay (15 January 2015). "Updated: How to upgrade your 3DS SD card, to 64GB and beyond". Lofi-Gaming. Retrieved 2018-12-21. ^ List, Jenny (29 November 2017). "Ask Hackaday: How On Earth Can A 2004 MP3 Player Read An SDXC Card?". Hackaday. Retrieved 2018-12-21. ^ Sims, Gary (9 May 2016). "High capacity microSD cards and Android – Gary explains". Android Authority. Retrieved 2018-12-21. ^ "SD Formatter 4.0 for SD/SDHC/SDXC - SD Association". Sdcard.org. Retrieved 2014-01-02. ^ "Capacity (SD/SDHC/SDXC/SDUC) - SD Association". www.sdcard.org. Retrieved 2019-02-15. ^ a b Kim, H; Agrawal, N; Ungureanu, C (2012-01-30), Revisiting Storage for Smartphones (PDF), America: NEC Laboratories, table 3, Speed class considered irrelevant: our benchmarking reveals that the “speed class” marking on SD cards is not necessarily indicative of application performance; although the class rating is meant for sequential performance, we find several cases in which higher-grade SD cards performed worse than lower-grade ones overall. ^ a b Lui, Gough (2014-01-16). "SD Card Sequential, Medium & Small Block Performance Round-Up". Gough's techzone. Retrieved 29 November 2015. Variations in 4k small block performance saw a difference of approximately 300-fold between the fastest and slowest cards. Distressingly, many of the tested cards were mediocre to poor on that metric, which may explain why running updates on Linux running off SD cards can take a very long time. ^ "Raspberry Pi forum: SD card benchmarks". Retrieved 2014-08-12. ^ a b c d "SD Speed Class - SD Association". SDCard.org. Retrieved 2013-11-13. ^ a b c d "Bus Speed (Default Speed/ High Speed/ UHS) - SD Association". Sdcard.org. Retrieved 2013-11-13. ^ "SD cards branded with an upper-case 'I' are faster, yo". Engadget. 2010-06-24. Retrieved 2010-08-22. ^ Rigg, Jamie (2013-07-16). "Toshiba's Exceria Pro SDHC cards claim 'world's fastest' write speeds of 240 MB per second". Engadget.com. Retrieved 2014-01-02. ^ a b c d e f g h i j k l "SD Part 1, Physical Layer Simplified Specification, Version 3.01" (PDF). SD Association. 2010-05-18. Archived from the original (PDF) on 2013-12-05. Retrieved 2013-11-25. ^ "Association Triples Speeds with UHS-II" (PDF). SD Card. 5 January 2011. Retrieved 2011-08-09. ^ Galbraith, Rob (2011-01-05). "SD Association announces UHS-II, ultra high-speed SD card specification". Retrieved 2011-01-05. ^ "SD Association Doubles Bus Interface Speeds with UHS-III" (PDF). 23 February 2017. ^ "Introducing SD Express". Retrieved 23 December 2018. ^ Gartenberg, Chaim (February 25, 2019). "Memory cards are about to get much faster with new microSD Express spec". The Verge. Retrieved 18 March 2019. ^ Hachman, Mark (February 25, 2019). "The microSD Express standard combines PCI Express speeds, microSD convenience". Retrieved 18 March 2019. ^ "Bus Speed (Default Speed/High Speed/UHS/SD Express) - SD Association". www.sdcard.org. Retrieved 2019-02-15. ^ "SD Express Cards with PCIe and NVMe Interfaces" (PDF). SD Association: 9. June 2018 – via SD Association. ^ a b "Speed Class Standards for Video Recording - SD Association". www.sdcard.org. ^ "NEW SDXC AND SDHC MEMORY CARDS SUPPORT 4K2K VIDEO" (PDF). SD Association. Retrieved 2013-11-13. ^ "Speed Class - SD Association". www.sdcard.org. Retrieved 2019-02-15. ^ " "Application Performance Class: The new class of performance for applications on SD memory cards (SD 5.1)" (PDF). sdcard.org. November 2016. ^ "Application Performance Class - SD Association". www.sdcard.org. Retrieved 2019-02-15. ^ "Flash Memory Cards and X-Speed Ratings". Kingston. Retrieved 2017-08-05. ^ "Simplified Specifications - SD Association, version 3.10 , Part 1, Physical Layer, section 4.3.6" Write Protect Management"". www.sdcard.org. Retrieved 2019-04-11. ^ "Windows Phone 7 Secure Digital Card Limitations". ^ "Windows Phone 7's microSD mess: the full story (and how Nokia can help you out of it)". ^ "Activating New Mobile Services and Business Models with smartSD Memory cards" (PDF). SD Association. November 2014. Retrieved 2017-08-02. ^ "smartSD Memory Cards". SD Association. Retrieved 2016-02-23. ^ "MicroSD Vendor Announces Taiwanese M-Payment Trial Using HTC NFC Phones". NFC Times. Retrieved 2016-02-23. ^ "Garanti Bank deploys NFC services on microSD". RFID Ready. Retrieved 2016-02-23. ^ "DeviceFidelity launches new range of NFC microSD devices". NFC World+. Retrieved 2016-02-23. ^ "Eye-Fi". Archived from the original on 2010-08-26. Retrieved 2010-08-22. ^ Robson, Wayde. "AudioHolics". AudioHolics. Retrieved 2014-01-02. ^ "slotRadio". SanDisk. Retrieved 2011-11-27. ^ "A-DATA Super Info SD Card 512MB". Tech power up. 2007-02-20. Retrieved 2011-12-30. ^ "Simplified Version of SDIO CARD SPEC". SD Association. Retrieved 2011-12-09. ^ "Inside Marshmallow: Adoptable storage". Android Central. 2015-11-15. Retrieved 2016-02-23. ^ Andrew (bunnie) Huang (of chumby). "On MicroSD Problems". Retrieved 29 May 2013. ^ Schnurer, Georg (2007-02-28). "Gefälschte SD-Karten" [Fake SD-cards] (in German). Heise mobile – c't magazin für computertechnik. Retrieved 2013-06-07. ^ Feddern, Boi (2013-03-18). "Smartphones wählerisch bei microSDHC-Karten" (in German). Heise mobile – c't magazin für computertechnik. Retrieved 2013-06-09. ^ "H2testw heise Download" (in German). Retrieved 2016-11-26. ^ "F3 by Digirati". Retrieved 2016-11-26. ^ "MEAD-SD01 SDHC card adapter (Sony)". Pro.sony.com. Retrieved 2014-01-02. ^ "TS-7800 Embedded". Embeddedarm.com. Retrieved 2010-08-22. ^ "About the SD and SDXC card slot". Support.apple.com. 2013-06-08. Retrieved 2013-11-13. ^ "Embedded SD". SD Association. Retrieved 2011-11-30. ^ "iNAND Embedded Flash Drives". SanDisk. Retrieved 2011-11-30. ^ "Linksys WRT54G-TM SD/MMC mod – DD-WRT Wiki". Dd-wrt.com. 2010-02-22. Retrieved 2010-08-22. ^ "About". SD Association. Retrieved 2011-05-02. ^ "SD Part 1, Physical Layer Simplified Specification, Version 4.10" (PDF). Archived from the original (PDF) on 2013-12-02. Retrieved 2014-01-02. ^ a b c d SD Memory Card Specifications – PART 2 FILE SYSTEM SPECIFICATION – Version 1.0. 1.0. SD Group, Matsushita Electric Industrial Co., Ltd. (MEI), SanDisk Corporation, Toshiba Corporation. February 2000. ^ "SDXC memory cards promise 2 TB of storage, 300 MBps transfer". Engadget. 2009-01-07. Retrieved 2010-08-22. ^ Any operating system used on Raspberry Pi generally have to boot off a Live SD, most commonly Raspbian. ^ "Optimizing Linux with cheap flash drives". Linux Weekly News. Retrieved 2011-04-11. ^ "WinXP SP3 cannot read 4GB SD card in multicard reader". Egg head cafe. Retrieved 2010-08-22. ^ "Sharp Linux PDA promotes the use of proprietary SD card, but more open MMC works just fine". Linux.com. Retrieved 2010-08-22. ^ "OLPC mailing list archive". Mailman.laptop.org. Archived from the original on 2011-04-12. Retrieved 2010-08-22. ^ MMC 4.1 Specification (PDF), JEDEC, 2008, p. 7 . ^ MMC 4.0 spec does not support 1.8V (PDF), United States: Transcend, 2009 . 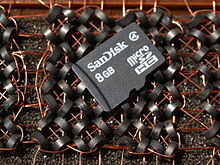 Wikimedia Commons has media related to Secure Digital, miniSD and microSD.